A 26-year-old man has been charged with a series of public order offences including possession of offensive weapons, a 10 foot pole and a wooden board. 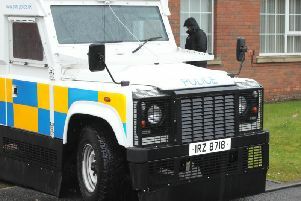 Stephen Vincent Anthony McPolin, Edenderry Park, Banbridge, had six charges put to last Thursday at the local magistrates’ court, sitting in Newry. The allegations relate to an incident that occurred on October 16 this year at Edenderry Park. McPolin is charged that he used disorderly behaviour, he attempted criminal damage to a police car, he had an offensive weapon, a 10 foot pole, with intent to commit an indictable offence, namely assault. He is also charged that he assaulted two police officers and he was in possession of an offensive weapon, a wooden board. A police officer said she believed she could connect the accused with the charges. The defendant’s solicitor asked for an adjournment for two weeks to have some discussions with the prosecution.McPolin was released on his own bail of £250 to appear again in court on November 24.